I was recently at a clergy event where the leader had us attempt a worship song that he pulled from the Internet. It was an impressive high-tech affair, connecting a smart phone to speakers and combining it with overhead projection to display the words. I had never heard the song before and so I did not even attempt it but that allowed me time to observe. It was obvious that this particular praise song was written as a solo piece. It was also performed in a solo fashion even though it was presented as a corporate experience. So as the praise leader was singing in his personalized rhythm, it was not possible to join in, even by those who knew it well. As a result our proposed corporate worship was turned into a room full of disharmonized solos with each person in pursuit of the melody. This experience was not an isolated event. I witnessed a similar thing at our recent annual Synod and I have seen it at worship services of other traditions as well as other Anglican churches. This caused me to reflect on what we were implying about the nature of the Church through this kind of worship. When the Church gathers for worship are we to be a room full of solo artists or are we to be a united voice? And what of the worship leader? Is he the center-staged star of the show or is he a servant who unites our voices by drawing attention away from himself and to the Lord? The comment above about people seeking a certain feeling or experience through praise music leads to a second way that it can lead to poor ecclesiology. There is a reason that so much of praise music is void of content and exhaustingly repetitious. It is because its goal is not to edify the mind but rather to engage and at times even manipulate emotions. The unspoken perspective is that if people don’t get goose bumps then they won’t feel that they have been to Church. Friends have told me of being in services where they were scolded by the worship leader because they were not acting “excited enough” about Jesus. But is that the role and purpose of Church? Is worship about creating a certain experience or getting us excited? Sadly the answer for many would be “yes.” And so therapeutic oriented sermons are linked with emotion-based music so that people leave Church feeling moved even if they are spiritually and morally unchanged. Again, is that really the role and purpose of the Church? It is not my contention that all praise music is bad, just as I would not argue that all hymns are good. Some are downright unsingable. Nor is this meant to be an indictment of all contemporary music since at some point in time all music is contemporary. Rather this is an appeal to recognize that there is a vast difference between theologically concentrated hymns and vacuous praise music that sounds like something on the radio. To paraphrase Benson in his book Living Prayer, perhaps the music we use to worship God should be different from the music we make love and sell cars to. One of the most meaningful experiences I had as a preacher happened years ago in the Jesus Movement. I preached a series on the attributes of God and as I did a couple named Watson and Becky Frawley wrote hymn quality songs about each attribute ( you can find their music on the web). In doing so they moved our worship from how we felt to who God is, and this took us to a whole different level of spiritual maturity. That is what our great Anglican hymns do for us today and that is why it baffles me when we trade our rich tradition of worship for 7/11 songs (singing same 7 lines 11 times). It is typical today to seek a compromise by having what is called “blended worship” which combines hymns and praise music. It has been my experience that is rarely done thoughtfully and the result is doing neither very well. The worship of the Church should reflect the nature of the Church. She is the temple of God, not a venue for a concert or a show. A church father said, “He who sings, prays twice” and so our worship should be more like a prayer addressed to God than a pop song about us and how we feel. 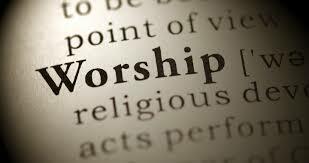 Worship should be presented as a holy offering, it is to be God honoring. It is not a vehicle for getting a spiritual high, which in fact is not spiritual at all. Jesus said that God seeks those who will worship Him in spirit and in truth. Our worship should reflect that reality, being less about us and more about Him.